How to preserve the herbs? Herbs: there's nothing else so small that can add so much to a recipe. They are not only for garnishing, but are a true part of the dish, sometimes one of the main ingredients. A small example of the "power" of herbs: you make a chopped carrot salad, which is very good with a vinaigrette, but if you add a few chives and chopped flat-leaf parsley, it's really something else. So herbs, simple as they are, can transform your recipes. You will find on these pages, some advice and information on using the most commonly used herbs. 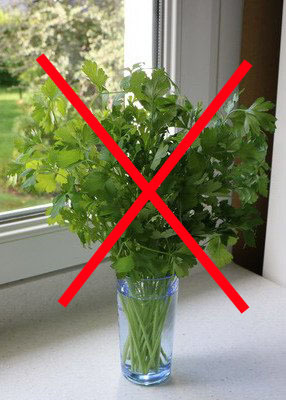 To keep them if bought fresh and cut (a bunch of parsley for example), putting them in a glass of water by the window is not a very good idea. 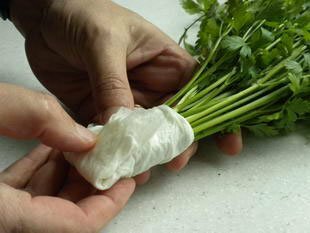 It's much better to wrap the stems in wet absorbant paper, wrap again in aluminium foil or a plastic bag, and put in the fridge. You can also freeze them easily, see the dedicated page for the herb. Some herbs, like bayleaves or thyme can also by dryed, but this is not as good (for flavour) as using fresh or frozen. As fresh as possible, don't leave cut herbs lying around close by something cooking. The heat will make them wilt and dull their flavour. The ideal way is to add herbs at the last moment. If possible try to avoid electric herb choppers which usually make a herb paste instead of chopping. 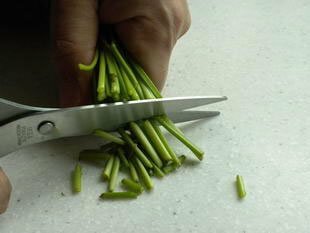 It's much more efficient to chop herbs with scissors or a sharp knife at the last minute. Often only the leaves or tips of herbs are used, but if it's to add flavour to a sauce or cooked dish, it's very important to use the stalks as well, which are full of flavour, especially parsley in a bouquet garni for example. Generally the herbs do not keep well once cut, and we all tend to just put them in a glass of water, like a bouquet of flower, but this is not a good idea. With this method you can easily keep your plants several days. You can of course buy herbs at the market or supermarket, but if you can create a small "herb garden" at home it will be of great benefit: practical, economical, and what a pleasure to say "It's from my own garden". To do this, you don't even need to have an actual garden or backyard, as most of the herbs mentioned on this page can be grown easily in a pot by a window or on a balcony. This is how the chives and parsley grown by Robert and Françoise (very goods friends of mine, in their cottage) come to be more beautiful than mine grown in my garden. Fry herbs for a few seconds in hot oil, to serve with another dishes. Do try especially: fried sage with vegetables for accompanying white meat, fried parsley with fish fillet (be careful when you put parsley in hot oil, it splashes a lot because it contains a lot of water). Use one or several herbs to make herb oil or herb salad. You've probably heard of it, "L'omelette aux fines herbes", but which are they? According to Auguste Escoffier: parsley, chives, chervil and tarragon. To keep celery fresher for longer. 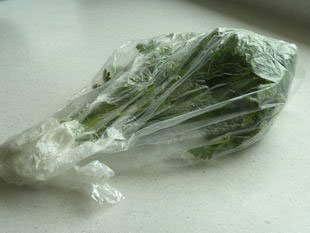 After purchase, trim off the leaves, wrap the celery completely in aluminium foil and put into fridge. I have kept celery in my fridge for 2 weeks this way and it keeps very well without it going soft.